All transactions are safe and secure with a reliable history in online purchasing behind each of our associates. 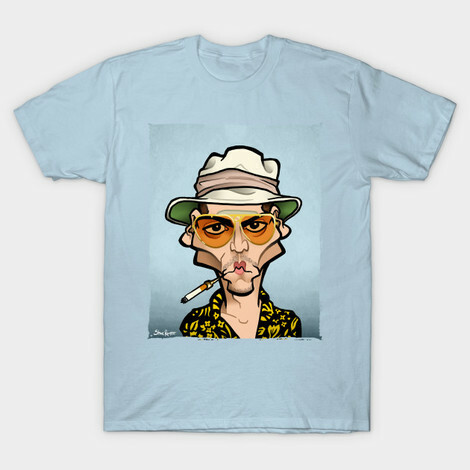 Buy the Raoul Duke T-Shirt to own Fear and Loathing clothing and merchandise. This cool Hunter S. Thompson t-shirt features a caricature of Raoul Duke. Dress in it to repeat the Johnny Depp quote, "Let's get down to brass tacks. How much for the ape?" Wear this tee as you practice Gonzo journalism, where the author participates in, and at times even instigates, the experiences of his subject. A similar symbol to the one on the Gonzo Fear and Loathing t-shirts displayed earlier was used by Thompson on fliers for his bid to be sheriff of Aspen. In addition to the Raoul Duke T-Shirt above, browse the Fear and Loathing Clothing Gallery for more apparel like men's and women's clothes, kids shirts or hoodies.